Spectacular Sorrento for 2 with Topflight, the Italian Specialist on 14th Oct.
Stay for 7 nights, at the 4 star plus Hotel Bristol in spectacular Sorrento with Topflight, the Italian Specialist. 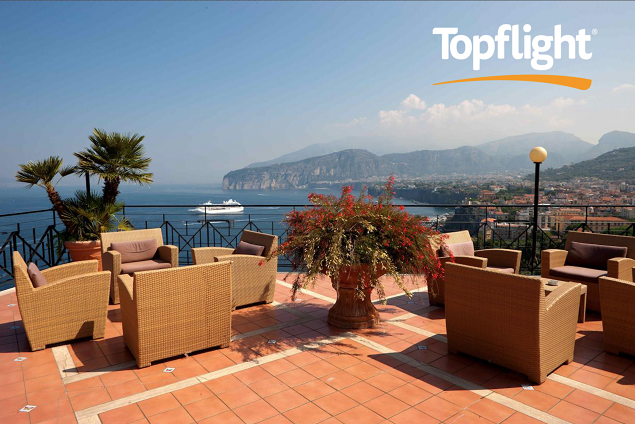 Rewarding Times are collaborating with Topflight to offer you a last chance getaway to the stunningly beautiful Sorrento. Enjoy a 7 night stay in the elegant 4 star plus Hotel Bristol, on a half board basis, from the 14th of October. Flights, transfers, 20kg baggage allowance, our resort manager service and a guided Sorrento walkabout are all included. Nestled into the cliffside, providing breathtaking views across the Bay of Naples, the Hotel Bristol offers its guests an elegant and luxury-filled stay, with a service level that’s second to none, all in the midst of the stunningly beautiful Sorrento. You are guaranteed one of the best seats in town here. Marvel at the majesty of Mount Vesuvius, standing proud across the bay, as you enjoy a drink on the bars terrace. The 7th floor restaurant, with its floor-to-ceiling windows, is the perfect place to soak up the picture postcard views, while an army of charming waiters see to your every need. Choose from a range of both traditional Italian and delicious international dishes, across 3 mouth-watering courses, each evening. And for breakfast, head back to the restaurant in the mornings to enjoy a marvellous buffet selection with eggs and bacon, made to order. Breakfast is always a highlight with guests at the Hotel Bristol - sipping coffee, as the sun comes up over Sorrento and it's bay is truly hard to beat! Enjoy a week of perfectly peaceful relaxation in this sophisticated and elegant hotel, where your every need is catered for. And as the hotel is just a ten minute walk downhill to the centre of Sorrento, you can lazily stroll down to enjoy a drink, take in the sights or to simply drink in the atmosphere. Set on a spectacular headland, Sorrento is located on one of the most magnificent coastlines in Italy, with breathtaking views sweeping across the Bay of Naples. It is both an ideal base from which to explore the main sights of the Neapolitan region such as Pompeii, Vesuvius, Capri and the Amalfi Coast, as well as an enchanting town in its own right. Spend your days lazily strolling through its narrow cobblestoned streets lined with beautiful, historic buildings, that now house restaurants, ice-cream parlours and shops selling everything from local handicrafts to designer clothes and not forgetting the delicious Limoncello liqueur for which the region is famous. Price is based on 2 adults sharing, with a stay for 7 nights in the 4 star plus Hotel Bristol on a half board basis. This holiday must be taken on the selected date of 14th October 2018 and is subject to availability. There are 10 rooms available for this offer. Offer includes return flights from Dublin to Naples, return transfers, 20kg baggage allowance, 7 nights accommodation in the 4 star plus Hotel Bristol on a half board basis, a guided Sorrento walkabout, all taxes and a resort manager service in resort. Once you have received your voucher, please contact Topflight Holidays with your voucher number, name and address, no later than 14th September 2018.